If you’re looking to train boxing, MMA or Muay Thai at home, an RDX punch bag can make a great investment. RDX are a proven martial arts brand, and they produce a decent range of high quality punch bags – many of which come with fixtures, fittings, and even gloves thrown in. However, the choice of punchbags and their features can be a bit overwhelming. So, I’ve put together this guide to walk you through the different types of RDX punch bags available, reviewing each one, and recommending my top picks. The straight bag is RDX’s most popular heavy bag, and will certainly fit most people’s home training needs. It’s a big sturdy, well-made heavy bag which comes in a range of lengths and weight. Overall it caters to most levels of ability and has a good amount of swing and shock absorption. The straight bag is RDX’s most popular heavy bag, and will certainly fit most people’s home training needs. It’s a big sturdy, well-made heavy bag which comes in a range of lengths and weight. Overall it caters to most levels of ability and has a good amount of wing and shock absorption. Some fitting required, and you will have to drill roles into a wall or ceiling to hang, so DIY skills are needed! Some of the extras thrown in such as the gloves and skipping ropes are pretty basic, but they do the job. If you are keen to train angled shots like uppercuts and body shots, along with kicks and knees – then an angled bag could be a good choice for you. Whereas a straight bag only allows you to strike at a vertical surface, the curved surface of the angled bag allows you to strike at a variety of different angles and really mix your shots up. The RDX angled bag is of the same high quality of the standard bag, and comes with the following features. The RDX wrecking ball punch bag is much smaller bag (around 60cm long) which is designed to hang around head height from the ceiling or a wall bracket. It’s purpose is to mimic an opponents head so that you can focus on training head shots and get a full range of motion around it. The wrecking ball has the following features. You are restricted to only training boxing head punches with this head bag, due to it’s short length – you cannot train kicks, body shots etc. When looking to buy an RDX punch bag, you need to think about your intended use for the punch bag, and where you intend to use it. Do you have bags of room and wall you don’t mind drilling in to? Or do you have limited space and areas to hang the bag? Once you know those things, here are some aspects of the bag spec you will need to consider. Punch bags take a lot of punishment, especially if you use them regularly over weeks and years. So picking a punch bag with a strong exterior is essential. Personally I would always go with genuine leather, or a quality synthetic leather such as Maya hide. Avoid vinyl and plastic as they will crack after a bit of use. Most punch bags are filled with shredded material, as this has been proven to give a solid weight with enough cushioning to cushion your strikes. Sometimes smaller bags are filled with more dense materials such as maize to give them more weight – which makes them more solid to hit. 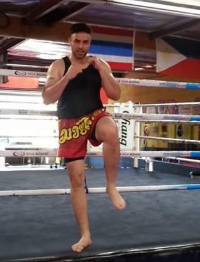 If you are looking to train Muay Thai or MMA then you should probably get a 5ft long bag to allow you to throw lower kicks. If you are training western boxing then a 4ft bag will allow you to train a full range of boxing punches. Generally speaking, heavy hitters should go for a heavier bag, so that is has more resistance from your shots and doesn’t swing around excessively. So, if you’re well-built, opt for a heavier bag. It’s really important to think about how you will hang your punch bag before you order it. There’s nothing worse than paying for a punch bag, having it delivered, and then realising you’ve got no way of hanging it. Make sure you check what fixtures and fittings come with the punch bag bundle, as well as what other things you might need to buy in order to hang it. These two videos show you how to hang a punch bag using either a wall bracket or a ceiling hook. Poorly fitted hangings for your punch bag could potentially be very dangerous, so if you’re not sure you can do it – get somebody who knows what they are doing to help. If you don’t fancy doing and DIY, you could also use a punch bag stand, but they are pricey and not as sturdy as using a fixture. Once you have your heavy bag set up, some of the drills below are great for cardio, technique, power and speed. Don’t forget to wear hand wraps and glove up whenever you train on the heavy bag.